our length - Approx. 11 hours (Pick up time - 8.30am; Drop off time - 7.30pm) depending on pick up location. The Pinnacles, two hours north of Perth, are an easily accessible natural wonder waiting to be explored. Next to the town of Cervantes and located within the desert landscape of Nambung National Park, the Pinnacles are fascinating limestone formations up to four metres high that were derived from seashells thousands of years ago. The Pinnacles themselves are a must see natural wonder on any trip to Perth, throw in a visit to a fantastic Wildlife Park to meet Kangaroos and Koalas, Lunch and wine tasting in the Swan Valley, Sand Boarding in Lancelin and this day trip is a great day out for all the family. This fun packed full day trip departs from Perth at 8.30am and the first stop is Caversham Wildlife Park where Explorers get to feed Kangaroos and get up close to Koalas. You will also get to see a wide range of other animals, birds and marsupials that are native to Australia. After an hour or so spent with these amazing Australian icons we jump back on the bus and take a short drive to the beautiful Swan Valley. The Swan Valley is well known for a wide range of internationally acclaimed vineyards, restaurants, cafes and art galleries. On this tour you will get a chance to visit one of the newest and best vineyards/breweries in the region and enjoy a lovely lunch with a glass of wine, beer or soft drink. We choose their meal from a menu which has been certified as being suitable for customers requiring Halal meals. 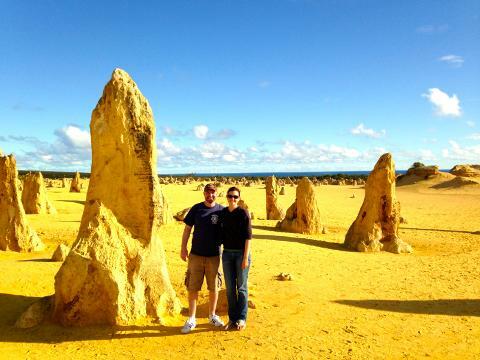 After lunch we take a drive up the Indian Ocean Road to the Nambung National Park for a close look at the Pinnacles. The park itself covers an area of 17,487 hectares and provides a natural habitat for an extensive range of animals and bird life. Luckily for us there is a modern discovery centre which houses fascinating interpretative displays with details of the Pinnacles themselves as well as the flora and fauna of the park. Aboard the Bus we will see the Pinnacles on a scenic drive through the park before setting off on foot for an easy paced walk through this eerie yet fascinating landscape, at which point you can take photos up close to the Pinnacles. Back aboard the Bus we head south for an hour to finish off the day at the adventure filled town of Lancelin. Here you can admire the extensive sand dunes and for the more adventurous explorers perhaps try out Sandboarding using the sand boards provided (think Snowboarding but replace the snow with sand). The tour returns us back to Perth at around 7.30pm having experienced some of the best activities that the region has to offer.